This dairy-free, gluten-free, low-carb hot chocolate is perfect for anyone following a keto diet. With little prep time and no cook time, you can enjoy this keto hot chocolate morning, noon, or night. Hot chocolate is a classic treat across continents, but your typical store-bought hot chocolate mix is packed with loads of sugar and other blood sugar-altering ingredients. Even sugar-free hot chocolates contain a slew of artificial ingredients including carrageenan, and other harmful food additives. But this creamy, keto-friendly hot chocolate recipe is free of unhealthy junk and has some fantastic health benefits to prove it. 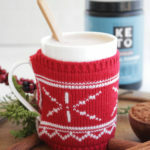 One of the main differentiators between this keto hot chocolate and most other hot chocolate recipes is the addition of MCT Oil Powder. MCTs, or medium-chain triglycerides, are amazing for your gut microbiome, reducing harmful bacteria without killing off your “good” or beneficial bacteria[*][*][*]. You can get MCT oil or powder at most health food stores these days, but Perfect Keto MCT Oil is special. It contains acacia fiber, a powerful prebiotic fiber that can increase healthy gut bacteria and potentially reduce symptoms of IBS (irritable bowel syndrome)[*][*]. Besides delivering a rich, bold flavor, cacao also provides a ton of polyphenols. Polyphenols aid overall digestive function and can even help with diarrhea[*]. Grass-fed butter may also help with digestion. It’s packed with butyric acid, a compound that acts as an anti-inflammatory, specifically in your large intestine. Butyric acid is good for overall gut health and some studies even look at its role in relieving symptoms of Crohn’s disease — a painful inflammatory bowel disease[*][*]. Research has shown that butyric acid supports overall digestive function, protects the intestinal lining, and may reduce complications of leaky gut, IBS, and Crohn’s disease[*][*]. MCTs are also known for boosting brain health. Multiple studies have shown that MCTs can promote better overall brain function and may even help fight symptoms of Alzheimer’s disease[*][*][*]. Cocoa is also a potent brain food due to its loads of antioxidants and phytonutrients. That’s good news for your neurotransmitters, plus chocolate may improve your mood by stimulating feelings of euphoria and even an increase in focus[*][*]. MCTs may also boost your energy[*]. You metabolize MCTs in a completely different way than you process other fatty acids. Instead of going through your digestive system, MCTs are processed more quickly to use as fuel. That’s why MCTs are so popular in the keto world — you use them quickly for fuel instead of storage, which supports ketosis[*]. The best part about this super simple keto hot cocoa? You probably already have the low-carb ingredients in your fridge and pantry. All you need for this recipe is one cup of hot water, cacao powder or unsweetened cocoa powder, Perfect Keto Chocolate MCT Oil Powder, grass-fed butter or ghee and some stevia or monk fruit to taste. You can mix the ingredients with hot water in a high-speed blender or combine your ingredients in a small saucepan and stir gently over medium heat until everything is incorporated. Craving a cold chocolate milk drink? Simple pour your “hot” chocolate over ice and serve. If you’re dairy-free don’t worry — you can use a couple of tablespoons of full-fat coconut milk in place of butter. Add all the ingredients into a high-speed blender, blending until smooth and creamy. Pour into a glass and top with a dash of cinnamon. Your creamy keto hot chocolate awaits. This creamy hot cocoa uses cacao powder, vanilla extract, and keto-friendly MCT fats, and it’s completely sugar-free. Use almond milk or heavy cream to stay keto and low-carb. Add all ingredients to a high-speed blender and mix on high until smooth. Pour into a cup and enjoy. Add a sprinkle of cinnamon if desired. Can also top with whipping cream or coconut cream.